Entry Requirements: 5 GCSEs at grade 4/C or above including either Mathematics or English, or a Level 2 equivalent in this area and GCSE Mathematics or English at grade 4/C or above. 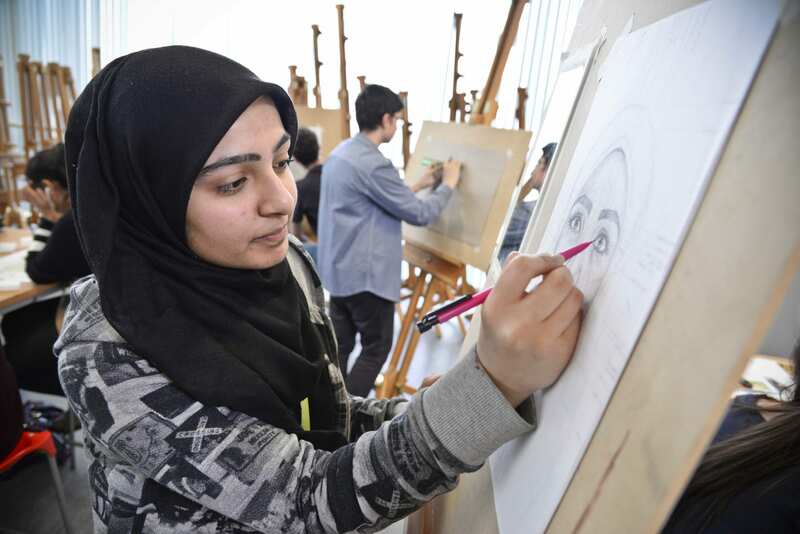 This exciting and challenging programme is designed to allow you the opportunity to build the practical skills and abilities you will need for a successful ongoing career in the world of art and design. Focused on developing your practical skills and abilities, the course offers you the chance to learn a broad range of art and design processes, and an opportunity to specialise in your second year and tailor your qualification to suit your own strengths and interests. This includes graphic design, photography, fine art, textiles and art history. You will cover all of these in year one, then choose three to use in year two – building your own career path. All your work will be assessed through the completion of assignments, marked by your tutors here in college. The type and content of these assignments will vary, depending on the particular units that are being assessed. You work will be graded against Pass, Merit and Distinction criteria. Your assignments will always carefully guide you to the requirements of each criteria and your tutors will support you in gaining the very best achievement that you can. You will present all your final year work to VIPs and industry professionals in a fabulous End of Year Show. You will also be invited to meet with professionals in creative industries to explore different job roles. Students are asked to pay a consumable fee that will provide them with various art materials and trips on the course. Costs will be confirmed at interview / enrolment. Trips and visits include The Liverpool Tate and Walker Gallery, Manchester Art Galleries, The Stitch and Knit show in Harrogate, Media Museum and Impressions Gallery in Bradford, Harry Potter Studios in London, and a residential visit to London.